With Thanksgiving quickly approaching, it’s important to make sure that your home’s interior design is up to par for all those critical family gatherings that are bound to occur. Because lets face it, the holidays are without a doubt a time for joy and happiness, but they can be pretty stressful, as well. Don’t worry; interior design can be a tricky, time-consuming task that sometimes only succeeds with the right amount of testing and, most importantly, patience. So where do you begin with your Thanksgiving home makeover? Well, right here of course! Decorating your home for the Fall is all about those quintessential warm, colors. But when you have loved ones over for Thanksgiving, why not give them something to talk about (besides all the delicious food) with a combination of interior design techniques that will provide, dare we say, an out of body experience! To begin, incorporate harvest colors and berry tones throughout your homes design and pair it with textures like leather or suede to tie that comforting feel all together. Don’t forget to throw in some still life pictures. Most importantly, appeal to their olfactory senses with some scented candles; why not go for the biggest Fall trend and try out some crackling Pumpkin spice candles. Granted, however, some of these methods are commonplace when it comes to creating a warm inviting home for Thanksgiving. 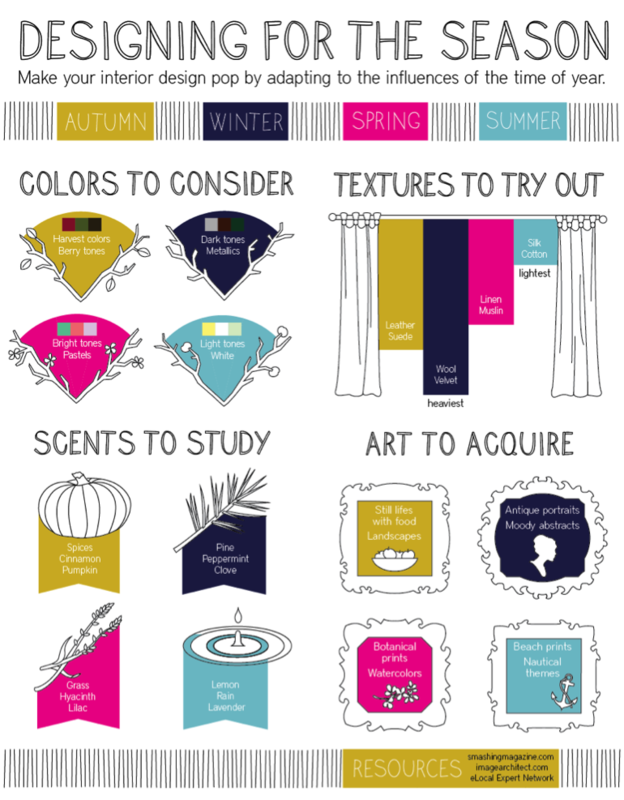 But some of the most important 2014 Fall trends would prove to brighten up your home in a dazzling way. Start with smaller details like candleholders or iconic detail pieces, one of the latest trends uses mixed materials like a metal base and stone setting above that. Geometric forms have also found their way into many homes in 2014, try your hand at the trend with furniture pieces that have geometric legs or honeycomb wall shelves to give your room a nice twist! Another neat technique you can try out is to blend an outdoor feel with your indoor living space. Not only will this hot 2014 trend bring your space to life just in time for Thanksgiving, but finding an iconic piece could bring a modern twist to an elegant design, so make sure to make it one-of-a-kind in your home to leave your Thanksgiving guests breathless. Finding all these great pieces will surely benefit your Fall home redesign in time for the holidays, but keeping them true to a color palette will be the defining factor in tying it all together! Try some bronze hues to convey a serene, yet formal atmosphere. And don’t forget, of course, that pop of color for extra points! Finally, show your creative side with some neat Thanksgiving DIY projects for that big dinner! Whether it’s pumpkin placements or golden acorns, each little detail will breathe new life into the easily forgotten-about spaces. Try placing fall leaves or flowers with warm colors throughout your home, whether it is the Thanksgiving table or bathrooms. All in all, Thanksgiving is a time for giving thanks for all that we have and a time for family and friends, so sit back, and enjoy the holiday! This entry was posted in home remodeling, real estate and tagged DIY, holidays, home decor, interior design, redesign, Thanksgiving, Thanksgiving projects.